Blackout for Human Rights and Campaign for Black Male Achievement collaborated on a powerful start-studded event "MLK Now" at the Riverside Church in Harlem, NY on the national Martin Luther King Jr. holiday. The event was held in the same space Dr. King delivered his 1967 “Beyond Vietnam: A Time To Break Silence” speech. "MLK Now" not only honored the legacy of Dr. King on the special day, but also honored other black leaders of the civil rights movement, as well as pioneers in arts, entertainment, spiritual leaders and more. The free event fused several generations of the general public and celebrity faces in one space. Appearances from Chris Rock, Harry Belafonte, Octavia Spencer, India Arie, Tessa Thompson, Michael B. Jordan, Mack Wilds, Jussie Smollett, etc. spanded over the course five hours The main event (let social media tell it) occurred during a unique conversation between film director and Blackout For Human Rights member Ryan Coogler and rapper J. Cole. Within an hour of their conversation ending, the internet would only be buzzing about a small portion of the discussion, In the core a serious conversation between the two, Coogler segways into a new topic asking Cole, "so how has married changed you bro?" Instantly J. Cole reacts to the question along with the audience in shock "Oh what is that is that my man?" The moment played out organically. Imagine being at a family gathering and your cousin brings up something you didn't want your mom to know. After Coogler apologetically admitted he's never interviewed anyone before, Cole schooled him that was a thing not to do. An engaged Coogler seemed to have thrown that question in for himself, but may have had intentions on tying it back in to the conversation. Not answering the question, but admitting in so many words he is married, like a professional, J. Cole changed the subject. Due to the lack of people who actually took the time to watch the livestreaming of this event, of course a 30-second clip would set assumptions for what actually was over a 20-minute dialogue with lots of insight. Anika Noni Rose assisted with J. Cole's introduction into the conversation with Ryan Coogler performing his song "Be Free," moving her to tears as she concluded the song. As J. Cole and Ryan Coogler takes their seat onstage, Cole thanks Anika Noni Rose admitting the song is very difficult for him to perform. Being the first time anyone performed one of his songs in front of him, he was filled with gratitude and understanding of his power as an artist, "it was almost like I didn't write that song and to realize I did, it was like its bigger than me." He went on to draw the correlation between the inspiration of writing "Be Free," and Ryan Coogler creating his film Fruitvale Station "that same level of crying and breaking down that I experienced watching your film is exactly what inspired the song in a sense." Writing "Be Free" wasn't something that he was able to do on the fly. The internal process of coming to grips with the painful things happening in our country that we become numb to, was a struggle Cole admitted many of us have. This internal process for J. Cole spanned from the killing of Eric Garner early 2014 to the murder of Mike Brown fall the same year. "I was in New York and the Eric Garner situation had happened. At the time a lot of things were happening. With a lot of us, its like these things are always happening. Its like we become so numb to it. It's almost too real to handle. It's this video of this man getting choked and I couldn't bring myself to watch it, I just didn't want to go to that place. Its similar to being back home in Fayetteville or anywhere hearing about somebody you came up with or somebody that's black and young getting killed and we give it like the "dang that's messed up, that's crazy, they out here wildin," but do we really dive in and understand how not normal that is?" After the death of Mike Brown, "I told God, I would like to say something in the form of a song. I'm not gon force it, if it comes it comes, if it don't come it don't come, but I would like to be able to be a voice. That night I was working on something totally different bro, a whole nother song and it just happened organically. The majority of us go through life numb....It's inspiring, but it's a little disheartening and crazy how a lot of those things are still happening. All of it is still so relevant. I'm curious to know how we can stop this cycle of great leaders who have great things to say who fight so hard and spend their whole lives fighting. I don't want to have to do this 50 years from now and they quoting you or whoever...We have to turn our perspective from the system that's totally wrong inward to ourselves to see how we've been affected by it. We have to work everyday to cleanse ourselves, we're poisoned." Ryan Coogler countered J. Cole's story, "We put a shield up and stuff to talk about it. Its tough to deal with the lies. I realized that the phrase black on black crime is a lie. It shouldn't be coming out of my mouth. From artist to artist, when you put out what you feeling, it makes me feel less like an alien...I think a lot of music coming from black men in our generation is showing the pain we live with everyday and is becoming more comfortable." Coogler dug deeper into the idea of black on black crime, pointing out white people don't say "white on white crime" its just violence. After dealing with his own harsh reality that all of his childhood friends are dead or locked up, Coogler uses film as an artistic expression to the emotions he endures as a young black man. The two spoke on how we as (black) people can attempt to uncondition ourselves with the psychological damaging lifestyles, thoughts and words we say on a day to day basis. Agreeing with different perspectives, both men believe the process of healing and changing the world begins within us first, then simultaneously the world will get fixed in the process. As the conversation closes, you almost forget the 30-second comedic moment happened. Throughout the talk, J. Cole humbly congratulates Ryan Coogler on his success and even admits he's inspired by his work. J. Cole also took the time to appreciate the moment, "this is two young black men having dialogue about whats happening right now." The exchange of brotherly love and comradery between not just two celebrities, but two conscious, strong black men talking about real issues within the black community is refreshing. It's not often the public sees this type of bond between men, in a way that makes you think they're people very close to you. 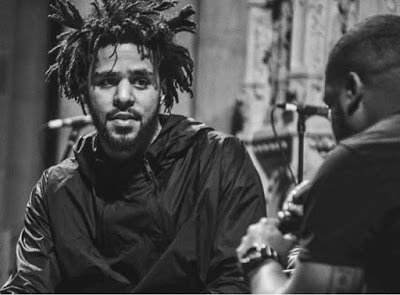 Both sharing a love for Hip-Hop, the arts & entertainment, Ryan Coogler and J. Cole choose to use their platform in a way that inspire and uplift, while still appealing to a younger audience. Regardless if it's film or music, being from Oakland, California or Fayetteville, North Carolina, Ryan Coogler lets J. Cole know, there's no difference in the two "it's not me bro its us...we're apart of the same body, my hand doesn't wake up and thank the other hand."